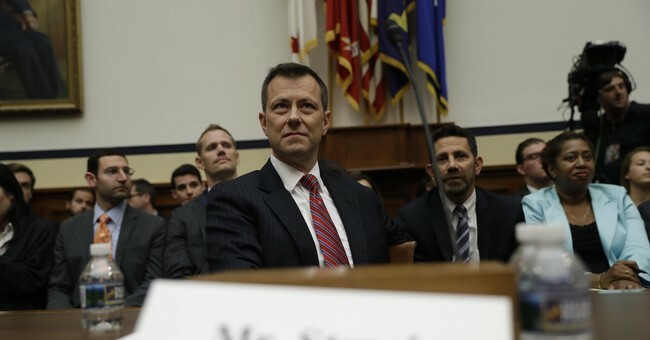 During his opening remarks in front of the House Committee on Oversight and Government Reform on Thursday, Peter Strzok defended his anti-Trump texts, insisting that they were merely expressions of his own deeply-held personal beliefs and had no effect on the Clinton email or the Trump-Russia collusion investigations. Strzok’s disingenuous testimony here stands in stark contrast to the fact that, as has been reported by Reuters(among others), Strzok told Page in one of their text exchanges that Clinton “just has to win” the presidential election. Whatever criticisms he may have had of Clinton, Strzok definitely hated Trump and wanted Clinton to win the presidential election. This is not seriously disputed by any reputable source. Electronic records show Peter Strzok, who led the investigation of Hillary Clinton's private email server as the No. 2 official in the counterintelligence division, changed Comey's earlier draft language describing Clinton's actions as "grossly negligent" to "extremely careless," the sources said. The shift from "grossly negligent" to "extremely careless," which may appear pedestrian at first glance, reflected a decision by the FBI that could have had potentially significant legal implications, as the federal law governing the mishandling of classified material establishes criminal penalties for "gross negligence." PETER STRZOK: Chairman Goodlatte and Gowdy, Ranking members Nadler and Cummings, thank you for the opportunity to testify before your committees again, this time in an open hearing. I testify today with significant regret, recognizing that my texts have created confusion and caused pain for people I love. Certain private messages of mine have provided for misguided attacks against the FBI, an institution that I love deeply and have served proudly for over twenty years. I’m eager to answer your questions, but let me first address those much-discussed texts. Like many people, I had and expressed personal political opinions during an extraordinary presidential election. Many contained expressions of concern for the security of our country ?opinions that were not always expressed in terms I’m proud of ?but having worked in national security for two decades and proudly served in the U.S. Army, those opinions were expressed out of deep patriotism and an unyielding belief in our great American democracy. At times, my criticism was blunt, but despite how it’s been characterized, it was not limited to one person or to one party. I criticized various countries and politicians, including Secretary Clinton, Senator Sanders, then-candidate Trump, and others. But let me be clear ?unequivocally and under oath ? not once in my twenty-six years of defending our nation did my personal opinions impact any official action I took. This is true for the Clinton email investigation, for the investigation into Russian interference, and for every other investigation I have worked on. It is not who I am, and it is not something I would ever do, period. I understand that my sworn testimony will not be enough for some people. After all, Americans are skeptical of anything coming out of Washington. But the fact is, after months of investigations, there is simply no evidence of bias in my professional actions. There is, however, one extraordinarily important piece of evidence supporting my integrity, the integrity of the FBI, and our lack of bias. In the summer of 2016, I was one of a handful of people who knew the details of Russian election interference and its possible connections with members of the Trump campaign. This information had the potential to derail and quite possibly defeat Mr. Trump, but the thought of expressing that or exposing that information never crossed my mind. That’s what FBI agents do every single day, and that’s why I’m so proud of the bureau, and I’m particularly proud of the work I and many others did on the Clinton email investigation. Our charge was to investigate it competently, honestly, and independently, and that’s exactly what happened. I’m also proud of our work on the Russian interference investigation. This is an investigation into a direct attack by a foreign adversary, and it is no less so simply because it was launched against our democratic process rather than against a military base. This is something that all Americans of all political persuasions should be alarmed by. In the summer of 2016, we had an urgent need to protect the integrity of an American presidential election from a hostile foreign power determined to weaken and divide the United States of America. This investigation is not politically motivated. It is not a witch hunt. It is not a hoax. I expect that during this hearing, I will be asked about that ongoing investigation. Where the FBI has directed me not to answer, I will abide by the FBI’s instructions. But let me be clear ? this is not because I don’t want to answer your questions. If I were permitted to answer, I would, and the answers would doubtless be disappointing to the questioners and undermine the conspiracy narrative being told about the Russia investigation. I understand we’re living in a political era in which insults and insinuation often drown out honesty and integrity, but the honest truth is that Russian interference in our elections constitutes a grave attack on our democracy. Most disturbingly, it has been wildly successful, sowing discord in our nation and shaking faith in our institutions. I have the utmost respect for Congress’s oversight role, but I strongly believe today’s hearing is just another victory notch in Putin’s belt and another milestone in our enemies’ campaign to take America apart. As someone who loves this country and cherishes its ideals, it is profoundly painful to watch, and even worse to play a part in. Mr. Chairman, I welcome your questions.